Inspired by my trip to Amsterdam, I have decided to bring out FM 2011, my favourite Football Manager installment and re-create the career of the legendary Rinus Michels, the father of Total Football, the mentor of Cruyff, the builder of Ajax’s legendary 60s and 70s teams as well as the man who bought The Netherlands their only major trophy and laid the framework for Cruyff’s Barca-Ajax blueprint. 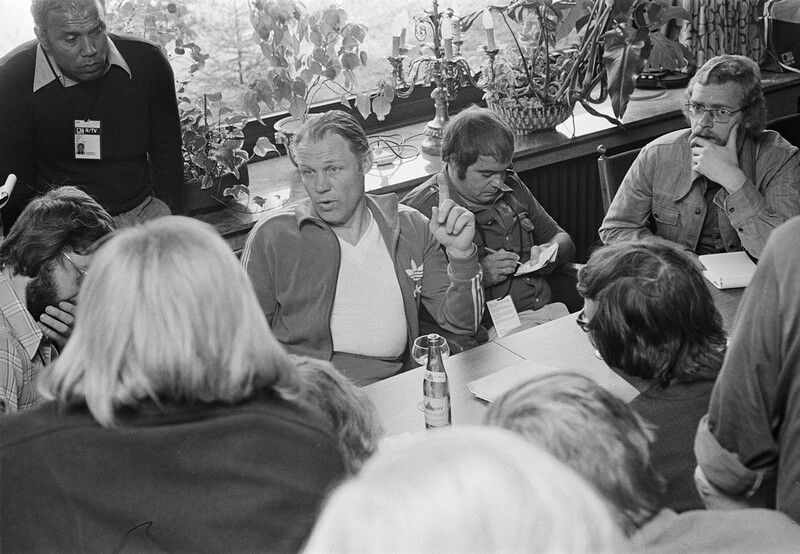 Michels (centre) in the Adidas tracksuits leading a coaching seminar. Michels began his managerial career in 1960, in order to make the game work with tournament years, this gives me two years to work at any club of my choice. I choose FC Zwolle in the Eerste Divisie, who I saw face Ajax. They are expected to make a push for promotion but aren’t favourites. They have a number of versatile players, however, and this will come in handy. You see the thing about Total Football, it’s not all liberal, hippie stuff. Michels was nicknamed The General for a reason. His teams were disciplined, when a defensive player goes forward to attack, one of his teams drops back, you thus need to have versatile players, with strong fitness and discipline. 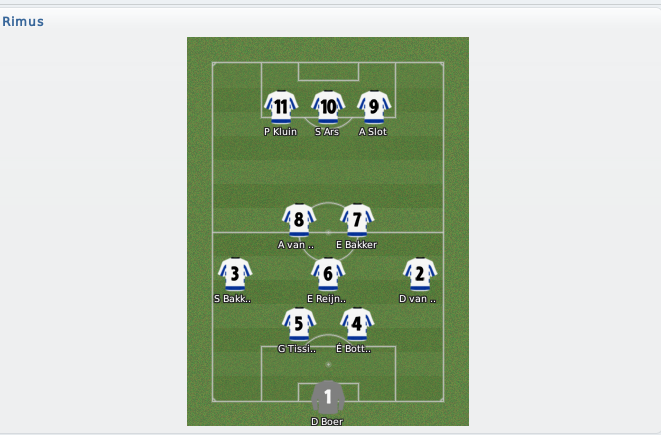 Above is the formation from my first friendly, a 2–0 victory over Winterthur. The tactics are the 2–3–2–3 formation which Michels would use use to devastating effect at AFC Ajax. The goalkeeper does his job, stays in goal and defends, we have two centre-backs who are also told to defend. Then we have two attacking wing-backs, as the sole wide players in the team all the width in the team comes from them, they press high up the pitch contributing firmly to attacks. The supporting defensive midfielder, provides cover allowing the full-backs to charge forward and link up play from the back to the front. The two central midfielder are set to automatic, changing function when the game requires able to win the ball, break up play and create. Now, the three man front line is where it really starts to get interesting. The right forward plays the trequartista role, the same role as the maestro Cruyff himself. He will drift around holes between the midfield and defence, patrolling the length of the final third, popping up and causing problems. The centre-forward operates as a poacher, whilst he is willing to get involved in link-up play his main job is to operate in the box, sniffing out chances and taking them. The inside left is perhaps the most hard-working of the forward three. His job is to operate as a deep-lying forward providing the link up play and then attacking late. These tactics allow players to play a variety of roles, but also it involves constant press and attack, meaning there would be no need to change the tactics mid-match. Andy Van der Meyde was the first man in, signing a two year contract after a year out of the game. Van der Meyde was a promising youngster during his first years at Ajax, but a drop of form of Inter and Everton coupled with personal issues meant the winger never fulfilled his potential. He was a cheap option and would be used sporadically before departing early but more on that later. Next in was PSV’s Youness Mokhar on loan. Mokhtar looked decent for Zwolle in real life. He would score one goal in 14 appearances and look solid for much of them, in his first year of first team football but we would have better options. Davy Klaassen, at 17, was also loaned from Ajax. He would join Chelsea at the end of the year due to his form. He struggled with injuries but performed well as a poacher alongside Danny Schreurs and Pepijn Kluin. Dave van der Bergh, twice capped international joined on a free. As someone who was always a decent punt in the lower leagues, he was one of a number of the old guard who would be key in the league, performing well in the left-wing back position and the occasional role at central midfield. Henny Schilder would be the only man we spent money on in the summer, joining from £350,000 from Volendam, his boyhood club. Schilder would prove to be a leader at the back and weaken one of our main opponents. January would see the year long loan of Piotr Parzyszek, who has joined Zwolle this summer in real life, he has always been a good punt as a young striker and scored on his debut, but failed to score for the rest of the year. Romanian left back Ionut Radu came in loan from Chievo, put the return to form of Martin Guarino, meant he was limited to just five substitute appearances. Ali Elkhattabi joined on a free transfer. He hadn’t had a club since 2006 but had scored 21 Eredivisie goals for Sprata Rotterdam and played for Morocco, so was a bit of a gamble. He would only play three times that season, but would win an important late penalty on his debut at title rivals Fortuna, though injuring himself in the process and being out for a month. Steve Olfers, would join after an impressive half-season for Qabala in Azerbaijan, Schilder had had a variety of partners at the back though none would perform consistently, Olfers came in and scored three goals in seven games and looked the perfect partner, but a long term injury meant he missed two months of the season and was not risked for the season ender at Go Ahead. Mehdi Makhloufi, a French-Algerian full back/defensive midfielder was taken out of his Union SG contract, Makhloufi had spent over a decade playing for top division clubs in Belgium, but would struggle to make his mark at Zwolle, getting sent off on his debut. Arnold Bruggink, a Dutch international would spend time on trial but his wage demands were unreasonable and a deal was not reached. The sole summer departure would be Eric Botteghin, who was sold behind my back to FC Twente. In January, former club captain Sjoerd Ars joined AGF in Denmark. Ars had scored just four goals for the club and had been stripped of the captaincy for goalkeeper Diederik Boer on the advice of Jaap Stam, the assistant manager. Ars wasn’t even first choice with Klaassen, Schreurs and Kluin being the preferred three. Franck Olivje and Domingos Duan-Lim being played out of position seemed to do better than him pushing him further down the pecking order. Ars also reacting poorly to being subbed and was poor in the next game. A bad influence on the dressing room, he was out. Van der Meyde didn’t really have a place in the team and was allowed to leave for RW Essen for more football. Yannick Wildschutt had made just two substitute appearances and was allowed to leave without much ceremony. I took over as manager before the Winterthur match, the pre-season results were good and full of confident performances. During the winter break, I intended to take the squad on a short tour for fitness. Due to the limited budget of the club, we could only travel in Europe. I gave the club a week off after the last game giving them Christmas with their families, before travelling to France to take on Amiens and Avion, both were routine wins and no-one got injured. The tactics worked from the get go with smashing wins over good sides. The victory over Volendam was really crucial with a late free-kick from Erik Bakker, who was allowed to evolve as a mature centre-midfielder and who would later win Player of the Season for the division. The strong start to the season allowed us to guarantee a play-off place after eight games due to winning the First Period. By this point, our older player such as Albert van der Haar and Dave van der Bergh were showing they still had something. Erik Bakker in the middle, and Tilsingh at the back were showing promise, but form became jittery. Klaassen picked up a knock and Kluin and Schreurs didn’t look too good without him. The introduction of Mokhar against Eindhoven resulting in a smashing 5–0 win, the biggest of the season. The squad’s ability to dig deep really begun to show through. Winning away at Volendam and Fortuna both of whom were top of the league after shock losses. It was against RBC, I was first introduced to Zlatko Lazetic, the season’s top scorer who would be the only player capable of having a chance of beating Bakker to Player of the Season. Victories over MVV and Eindhoven put us one win away from the title, but we couldn’t get over the line. This meant a grudge match at arch rivals Go Ahead to take the title. Captain Boer would have a knock going into this one. With van der Haar on the bench, Schilder would captain the side. te Wielen, who had only played cup football up to this point would start in goal. Rick Oosenschwalt would be promoted to the bench, with the potential to make his professional debut. The result was a dominate win for Zwolle. Go Ahead never looked like winning the game and didn’t have a single shot. The goalkeeper was their best player, as he saved seven shots as the side pushed forward intent on winning the league in style. Right wing-back Bram van Polen would be man of the match on his last game before joining Cercle Brugge on a free transfer. FC Zwolle would play the 2011–12 season in the Eredivisie. A routine win over SDCP which saw the emergence of young midfielder Olivje as a back up striker. Top flight side VV-Venlo were then torn apart, with Zwolle in cruise control and rounding off the win with two late goals either side of a consolation. NEC Nijmengen were too hard to control and eventually won the game in the fourth round. 2011–12 will be my last season at FC Zwolle, eagle eyed readers would already be aware of who I’ve joined in 2012–13, but I’ve literally just agreed the deal. At the end of the campaign, I signed a two year contract extension and rejected offers from Newcastle United and Parma. Bakker would win Player of the Season, Young Player of the Season and Under-21 Player of the Season, as well as the Zwolle Player of the Year. 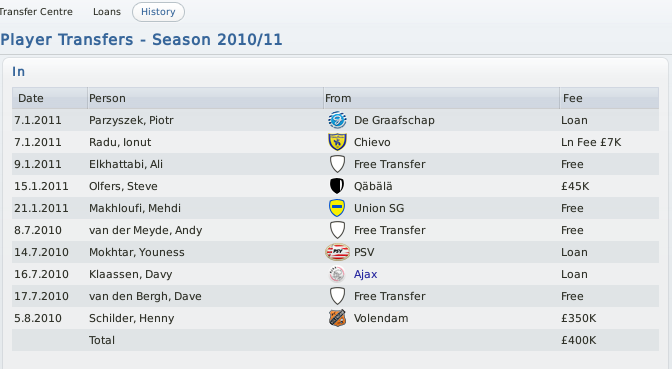 Wim Dusseldorp of Fortuna would beat me to Manager of the Season. Overall, 2010–11 was a very good season. The tactics had worked but next season would be tougher, would we have to go dirty, would we stay up, would we have a good cup run, only time will tell.